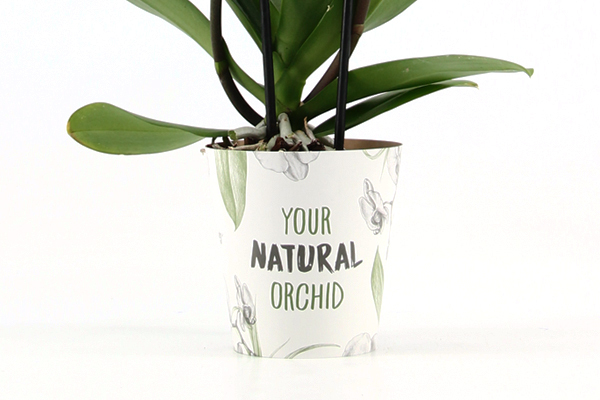 The Your Natural Orchid pot cover looks natural and authentic. We have emphasized this look with a unique pot cover for the concept. The story of the naturally grown Phalaenopsis is printed on the inside. Jan Stolk’s signature is proof of that authenticity. The cardboard pot cover over the pot offers a layer of protection during transport. This is therefore extra packaging, not a replacement for a pot. We supply versions in English, French, and German so that consumers in a whole range of European countries can learn about our ‘natural’ story. 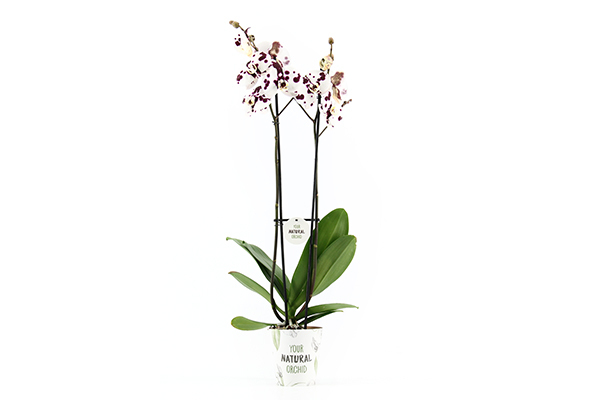 Of course, our orchids are also popular amongst buyers in other countries. We would be happy to help you develop a customized pot cover in your own language. Ask us for more information! If you want to complete the Your Natural Orchid look, combine the pot cover with our 4-hole tray!